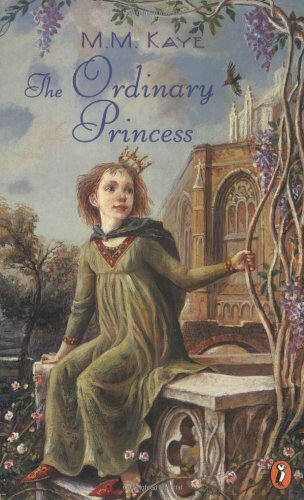 In the foreword to this book, author M. M. Kaye recalls reading the Andrew Lang fairy books, which included fairy tales from all over the world, and noticing that the stories were populated with beautiful princesses. She wondered what the stories would have been like if some of those princesses had been “gawky, snub-nosed, and freckled, with shortish, mouse-colored hair.” And so Princess Amy of The Ordinary Princess was born. And so Amy was—only not really. She retains the health, wit, charm, and cheerfulness bestowed on her by the other fairies, and those qualities serve her well. Her ordinariness takes the form of being an ordinary sort of pretty, with mousy hair that wouldn’t straighten and freckles that wouldn’t disappear. She also took little interest in her sisters’ hobbies of playing the harp, doing embroidery, and tossing a golden ball back and forth. Amy preferred to sneak out of the castle and climb trees and swim in the forest of Faraway. One after another, as the months rolled by, princes and Grand Dukes and Royal Highnesses and Serene Transparancies of every description, shape and size arrive at the palace of Phanff to pay a friendly visit, but in reality to meet Her Serene and Royal Highness the Princess Amethyst Alexandra August Araminta Adelaide Aurelia Anne of Phantasmorania. But none of them ever stayed more than one day. Desperate for a solution, the King and Queen decide that the thing to do is hire a dragon, lock Amy away, and spread the story that the dragon stole her. After all, what prince can resist a quest to slay a dragon and rescue a princess? As long as Amy is kept out of sight, it’s a perfect plan. But before the Minister in Charge of Hiring a Suitable Dragon and the subcommittee for drawing up the draft of a suitably worded proclamation can get the plan underway, Amy learns of it and decides to run away and avoid all the ridiculousness. This charming story is predictable is precisely the comforting way fairy tales so often are. We know from the start that somehow Amy will find happiness and that her very ordinariness will be the key. For Amy, ordinariness is indeed a gift that brings her more happiness than she’d ever find as a pretty princess. My one complaint about this otherwise lovely story is that it’s unfair to the pretty princesses, making them really dull, which they really can’t help because they weren’t allowed to be anything else. If I were going to get all political about it, I could say that the pretty princesses’ dullness is as much a critique of the fairy-tale-princess system as Amy’s rejection for her plainness is. But maybe this story is not meant to bear this kind of analysis. Oh, well, I did it anyway. Besides being overall a sweet and comforting story, this book is also quite funny, especially in all its jokes about palace politics and royal bureaucracy. There’s also just something so ridiculous about everyone’s despair at Amy’s looks that I couldn’t help but laugh, especially when, aside from a few wistful moments, Amy really doesn’t mind her looks. Jenny from Reading the End sent me this book as a comfort read, and I spent yesterday afternoon curled up with it. It was a pleasure to read, and I recommend it to anyone who enjoys old-fashioned fairy tales with a twist. I’m so glad you liked it! I always cheer myself up for the criticism you make about the pretty ones being dull (because you’re right — that’s a not-great aspect of the book!) by thinking that Amy’s right when she says they don’t get to have the fun she has. Though we don’t see it, I always imagine her older sisters being exhausted with the prison of expectations. Poor things! Anyway. I like it when Amy and Perry quietly eat melting ice cream together after the feast is over. That bit always makes me smile. I like to think the pretty princesses would have been interesting and fun people if they’d been given the opportunity to do anything other than protect and enhance their own beauty. And at least they weren’t mean. The scene after the feast is a good one. I also liked the part where they struggled to hide their giggling when they had to pretend to be strangers. So much happiness in that moment! This sounds lovely – I have really enjoyed M.M.Kaye’s romantic suspense ‘Death in…’ series, but have never ventured into her historical sagas and had never even heard of this book. I wasn’t familiar with MM Kaye at all before this, but it turns out I’ve heard of The Far Pavilions but hadn’t retained her name. I’ve read this now – gorgeous recommendation. I was feeling under the weather and it really hit the ‘cheer up’ spot. A lovely feel-good read. Sounds like a fun subversion of the beautiful princess trope — I do like your point about it being unfair to the other sisters, though. Will definitely check this book out! It subverts that trope very well and with a pleasing sense of humor.